I love these guys! Antoine "Mikey Rocks" Reed and Evan "Chuck Inglish" Ingersoll from Chicago, Illinois and Detroit, Michigan AKA The Cool Kids. Citing their influences on their MySpace as Funkadelics, Police, Jimi Hendrix, Ohio Players, Slave, Gap Band, Led Zepplin, N.E.R.D, Red Hot Chili Peppers, Timabaland, One Way, James Brown, Isley Brothers, Great Musicians. It's tongue in cheek Hip Hop, 80's revisited with a 00's twist. 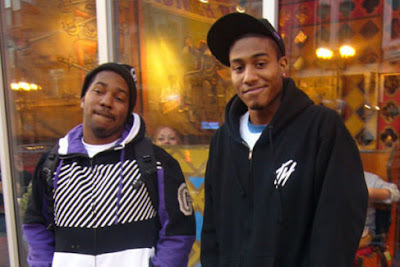 So the story goes "The members of The Cool Kids met in 2005 when Reed found a beat on the Internet that Ingersoll had produced.The two met to discuss terms of the beat's sale, and eventually ended up recording for two hours. They were inspired by hip hop in the 1980s and artists like Eric B. & Rakim.Ingersoll began promoting the new duo's material, and it was eventually booked by Josh Young of Flosstradamus for a DJ performance. At this performance (in a venue called Town Hall Pub), the duo met the electronic musician Diplo who offered to release a mixtape of their unreleased tracks titled Totally Flossed Out on his label Mad Decent, though it was eventually released on C.A.K.E. Recordings. They also received an offer from the DJ A-Trak to sign to his Fool's Gold label, which they did, but only for one single. Up until recently, all material had been released solely on the band's MySpace page—their recording contract came after performances at the CMJ Music Festival and Pitchfork Music Festival, on July 15, 2007. Eventually, The Cool Kids signed to Chocolate Industries, another independent label, which had previously been the label of rapper Lady Sovereign. Ingersoll has been the producer for tracks released thus far, but both work in rapping and production." Enough of the talking, lets do some listening.